Somewhere deep inside all of us, we know that God is real. But finding evidence of God's existence can seem difficult. There is no reason God shouldn't interact with us, so where are the miraculous acts of God? Are miracles real? Did the miracles in the Bible really happen? Do miracles still happen today? Or maybe miracles still happening today and we just don't know how to find them. We're going to explore from a biblical point of view why miracles still happen today. It’s commonly believed that “the perfect” Paul referred to is the Bible. Cessationists reason that since we have the complete Bible, spiritual gifts are no longer necessary. Therefore they don't believe miracles still happen today. But this notion is preposterous -- I offer a number of reasons why. Paul only mentions tongues, knowledge, and prophecy here. Presumably, other miraculous gifts like healing and casting out demons sill continue today. If we somehow assume all spiritual gifts ceased today, we'd have to give up gifts like pastors, administrators, knowledge, evangelism, and discernment. This doesn't seem wise, does it? The cessation of spiritual gifts doesn’t necessarily mean the end of miracles because they’re two different things. When the disciples fed the 5,000 and 4,000, cast out demons, healed the sick, and walked on water with Jesus, did they do it with spiritual gifts? Nope! The disciples didn’t receive the Spirit until the day of Pentecost after Jesus left. Would the completion of the Bible cause demons to give up their attacks? If anything, they would be compelled to attack even harder. Why would we let demons run rampant and ignore Jesus’ command to cast them out just because we now have the Bible? The Bible is essentially a how-to book on miracles. From creation on the first page to the promise of eternal life with Jesus on the last, the Bible tells of God’s miraculous interaction with humanity over and over again. To say that God no longer interacts with humans because the Bible is complete overlooks the whole purpose of the Bible. There are plenty of perfect things other than the Bible that Paul could be talking about. There is no more evidence that the perfect is the Bible than In-N-Out Burger (a perfect double-meat animal style and fries well... mmmmm)! But I don’t think Paul's referring to a burger joint, so let’s throw out the Bible theory too and find some more clues. We can see from this why miracles still happen today according to the Bible. Paul speaks of the same themes in both passages: spiritual gifts, when they will end, edification of the church, growing from childhood to maturity, knowledge, and the importance of love. When we compare, we can see clearly that spiritual gifts are for building up of the church through knowledge of Christ. Gifts will remain until we until we become mature and perfect like Christ. 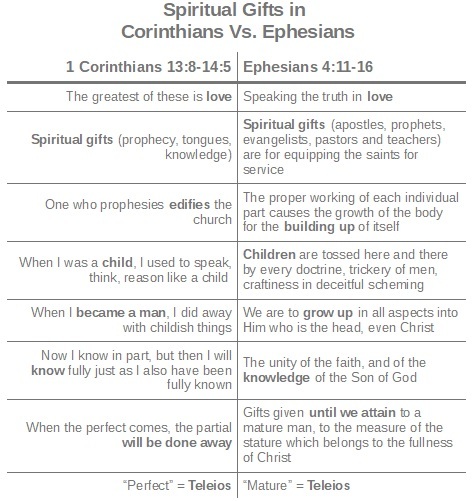 Here’s the kicker -- the word “perfect” in Corinthians is translated from the Greek word teleios, which is the very same word translated “mature” in Ephesians. Teleios means full-grown and complete. “The perfect” does not refer to the Bible, Heaven, the destruction of the temple, nor the resurrection. It refers to the completion, fullness, and maturity of ourselves becoming like Christ. Becoming like Christ is not an event, but a process that we are in today. This is why Paul compared it to growing up and running a race. Now, let me ask, as “the perfect” manifests in us and we become more like Christ, will miracles happen more or less? If we are like Christ, we will walk in the same miraculous power he did. Jesus even said, “Truly, truly, I say to you, he who believes in Me, the works that I do, he will do also; and greater works than these he will do.” Paul isn’t saying that miracles will cease. Quite the opposite -- Paul is encouraging us to continuously seek still greater miracles. Paul says that when we become fully like Christ, we will live a miraculous life without even needing spiritual gifts! There is biblical reason why miracles still happen today. But where is the evidence? Do miracles still happen today? Yes! While miracles aren't common for everyone, they should be common for believers. Today, miracles are a normal part of my life. In the past year, I’ve laid my hands on people and seen pain leave knees and shoulders, limps stop, headaches disappear, demons cast out, people speak in tongues, uneven legs grown out, and much more. I’m believing God for even greater miracles. And you can see these things in your life too -- it’s easy! But you'll never see them if you don't believe that miracles still happen. The first step to a miraculous life is to believe that it’s possible. Have faith. That's how you can begin to see miracles happen today. LOVE it! Full of biblical truth! Amen!